Bone loss in the jawbone is common when one or more teeth have been lost due to injury, decay, or trauma. Without the tooth in place to stimulate the jawbone, the bone around the missing tooth begins to deteriorate. Over time, the jawbone may deteriorate to such an extent that there is not enough bone to place dental implants. In cases such as these, your dentist may recommend having a bone grafting procedure. Bone grafting is the replacement or augmentation of missing bone around the teeth. There are three types of bone graft procedures: autogenous, allograft, and xenograft. Autogenous grafts take bone from one area of the patient’s body and transplant it to the location in the mouth being restored. The bone is usually taken from non-essential bones such as the chin. The benefit of an autogenous bone graft is that the bone used comes solely from the patient reducing the likelihood of rejection and infection. The bone is also still “live,” meaning it still has active cellular material. Allografts also use human bone transplanted to the area in the mouth being restored. However, allografts do not use the patient’s own bone. Instead, the bone usually comes from cadavers whose bones have been donated to bone banks. All allograft bone material is carefully screened and is considered very safe. Xenografts also replace bone in the area requiring treatment; however, the bone comes from a non-human source. Usually the non-human source is bovine (cow). Allografts and xenografts are used because they do not require a second surgical site to harvest bone, and ample amounts of bone can be easily attained. Local anesthesia is used to numb the area where the bone will be removed as well as the location where the bone will be augmented. An incision is made in the gums around where the bone will be augmented. 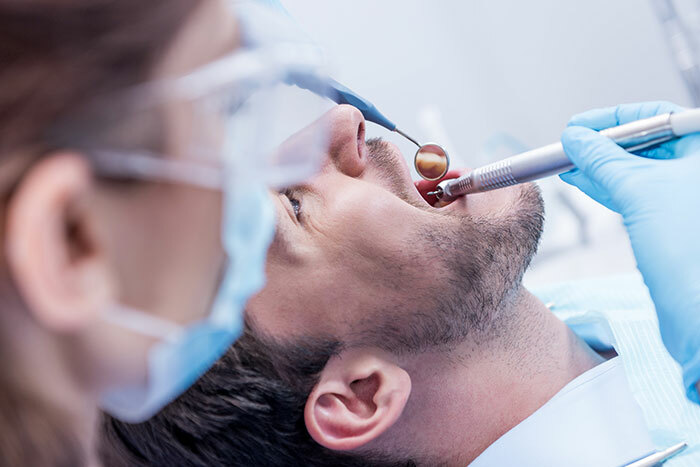 This is done so that the dentist can see exactly how much bone will be needed before harvesting it from the patient (if an autogenous graft is being performed). Next, the dentist will make a cut in the gums below the lower front teeth in order to expose the graft. The dentist will then remove a part of the bone along with any bone marrow. This incision is then closed with stitches. The bone removed from the graft area will then be anchored in place in the jawbone with small titanium screws. The dentist may place a mixture of your bone marrow and some bone-grafting material around the bone graft to help speed healing. The incision is then closed with stitches. After the procedure, you will likely be given antibiotics as well as pain medication. You’ll be asked to follow a restricted diet of soft foods, such as pasta and jello. Bone grafts usually take about six to nine months to heal completely. Dental implants will not be placed until your mouth has healed completely. Ready To Schedule A Consult? Copyright © 2019 Dr Jason Augustine DDS, MS, PC | Design & Development: Netera Group Inc.